With the Asian culture being vast and varied, the number of dating websites catering to Asian singles has markedly grown. Instead of navigating general dating sites, you can now find culturally likeminded others with little or no hassle and finally get your romantic life on the right track. In addition to profile verification safeguards and sophisticated features, easily affordable subscriptions make the whole experience quite workable even for those on a budget. If you happen to be an Asian single looking for romance, there is hardly a viable excuse for not utilizing this type of online resource. While some sites cater to the general Asian population, others such as Indonesian or KoreanCupid.com, offer an option for those of a particular culture or land. This can be especially helpful if you wish to date within your own culture but find your options limited due to geographic location or other issues. It’s worth keeping in mind that that these communities are non exclusive and you need not be Asian in order to sign up and take part. You merely need to have an appreciation of Asian men or women and their fascinating sophisticated culture. Depending on the site, the number of members can run in the thousands, if not millions. This provides a larger opportunity for members to find someone with similar interests and objectives in a relationship. Many times, members have a choice to find a compatible match in or close to their own city; or they may choose to get to know someone across the globe in another country. While the majority of singles are looking for romance and marriage, there are options that work to expand or maintain an individual’s social circle as well. Some sites are a way to find not only penpals but keep in touch with both online and real life friends. As an added plus, some online venues offer a language option link that will translate the website into one’s native tongue at no charge. This is especially helpful as it can help make members feel more comfortable and confident as they navigate the site and their personal online dating experience. 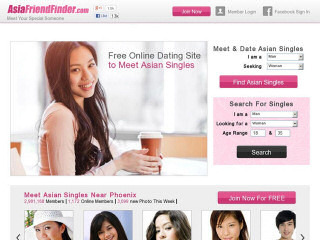 Asia FriendFinder.com is one of the largest Asian communities on the net. Because it is part of the FriendFinder Network, the site is able to boast nearly a half million members worldwide. The site’s format is smooth and easy to understand; something that allows members to sail through creating a profile once they have joined free of charge. As with most dating venues, members can state whether they are looking for friendship or romance. However, to help make finding a compatible match easier, you will be are provided with a personality test that analyzes key traits in your character. The results are then matched to other members with complementary attributes. Safety• To ensure the safety of its members, AsianFriendFinder uses a third party service to confirm a site user’s identification. This authentication process means there is less in the way of annoying fake profiles and scammers (however they do still exist). They also offer games and contests where members can win a free Gold subscription and all the perks that come with it. Fun• Fun features, such as virtual winks, can be used to break the ice and let another member know someone is interested in them. A language option feature allows non English speaking members to read the site in Vietnamese, Thai, Chinese and many others major Asian languages. Thaicupid.com is a dating site that looks to unite marriage minded Thai singles no matter where they are in the world. There is no charge to join and fill out a profile that allows members to give a full detailed description of themselves and the type of mate they are looking for. Matchmaking• An advanced search option helps sift through the profiles of the one hundred thousand plus members in order to find a compatible match. You will be able to find a potential interest in your own country or anywhere in the world and narrow it down to state or province and then city. Getting to know and staying in touch with a compatible match is easy thanks to an onsite instant message service and email account. As an added bonus, a translation feature is offered so that non English speaking members can still communicate efficiently and effectively. However, you will have to upgrade to a paid membership to receive this service. As thaicupid serves an international clientèle, a language option feature ensures the site can be read in Japanese, Dutch, Norwegian, Swedish, German and French. AsianDating.com is a basic Asian dating website for marriage minded singles looking to marry abroad. Established in 2000, the site has several thousand members spanning across the globe and offers a number of easy to use high tech features. Perks• To get a firsthand peek at all the perks without having to sign up, you can take a free onsite tour. There is no charge to sign up and become a member. Upon creating a profile, you can state whether your objective is geared towards marriage, romance, friendship, penpals or all of the above. While everyone is offered a free standard membership, upgrading to a paid subscription is what provides access to exclusive site privileges. Because the site has members from all over the world, there is a translation service for messages and a language option so that the everything can be read in English, Dutch, Finnish, French, German and Japanese. A personal homepage makes keeping track of emails and contacts a simple task. To help make the dating process more authentic, video profiles are offered in addition to such things as email, chat and instant messenger. As a member, you can also get involved in the online community by participating in onsite groups. KoreanCupid.com offers Korean singles a well put together venue for finding romance. With around one hundred thousand site members located worldwide, finding a likeminded match that shares the same culture becomes much easier. Those who decide to join can do so for free and get busy creating a profile that details just the right amount of personal information. Once you complete your profile by uploading a picture, you can then begin browsing the profiles of other members. A personal onsite homepage allows you to keep you online dating experience well organized. Rather than wade through thousands of profiles to find a compatible match, an advanced search option allows you to search using criteria such as geographic location, age, gender, religion, educational background and many others. This ensures that no time is wasted in finding that special someone. State of the art communication features include email, instant messaging and video and voice chat. However, to make use of some of these features, you will have to upgrade from a standard membership to a paid subscription. Along with language translation services, there is a language option that allows the site to be read in Korean or Japanese. IndonesianCupid.com is a relatively small community compared to others in this category; nonetheless, it has a solid user base with an estimated one hundred thousand active members. It serves to provide its members with dating, long term relationship or marriage options. To help users feel more confident about their online dating experience, an easy to navigate setup has been put into place. Members can create a profile and upload a picture with relative ease. Along with their own details, there is also opportunity for each individual to state a good amount of information on the qualities they would like in a mate. Once a prospective match has been located, you can use such things as the onsite email, instant messaging, voice or video chat features to get to know each other. To gain access to certain perks and privileges, members will need to upgrade from their free standard membership to a paid subscription. Paid memberships can be bought in monthly, quarterly and annual increments. The site also occasionally offers free trials to new members. Because the site is geared towards those of Indonesian culture, an English and Indonesian language selection is readily available at no cost. These paid sites are useless. You pay for a membership then you get nothing. Better off using the free sites… I think lately the best 2 dating sites. I’ve tried Filipino Cupid and Asian Dating both, and pretty much as soon as you start paying, the girls seem to lose interest… maybe something in their algorithm, but whats the point when I can just use the other sites completely free.